The Ultimate musical challenge. 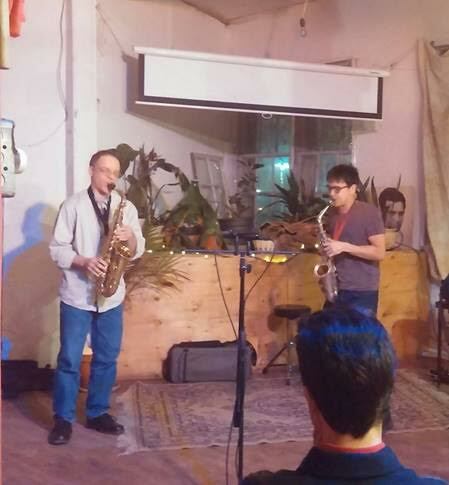 A man equipped with a saxophone and complete tonal, metric, and dynamic freedom faces off against an audience eager for entertainment. In these situations, only the devices of music in their most basic terms are of use as any attempt at complex tonal forms or chordal progressions would be futile. With only the notions of contrasting sound and motivic development in mind, Linsey Wellman accomplished an intrigue throughout his two 40 minute sets indicative of his immense musical prowess. Wellman seamlessly ventured from grabbing intimacy through droning rhythm and on to violent intensity never failing to surprise the crowd at every turn. The night began slowly. In the quietest moments, the power of intimate simplicity drew the audience forward leaving them unaware of what noise would be next to break the silence. With Wellman’s vast array of extended techniques in full force, every spaced-out, quite moment would only be contained in the realm of unpredictability. There were special moments where Wellman breathed into his saxophone and the whole process of the technical setup, pressing of the key, and beginning of the vibration could be heard truly encompassing the audience in the whole musical experience. He even used the audibility of his keys to his advantage sometimes creating some sort of meter with the clicking sounds. Authenticity is an overused word in music in this day and age, however, there is some validity to the point that a setting that provides for complete artistic control and an emphasis on in-the-moment collective experience results in a more advanced artistic endeavor. As the music progressed along, the emphasis on intimacy was swapped out for high intensity musical shapes. Wellman’s use of an oscillating ostinato evoked a circular melodic shape, which was made more interesting by the variations brought forward by the ever-present extended techniques. The linear musical pattern was accomplished through the use of fast dissension and ascension through the entire range of the instrument. Sometimes Wellman would employ an extremely angular melody encompassing somewhat random pitches of highly varying frequency resulting in a scattered sound schematic. By focusing on individual shapes, Wellman was able to develop his motives to their full potential in a very logical way. After each idea had been fully explored, the transition provided much needed contrast through the shock of untouched territory. Wellman’s mastery of musical architecture complimented his intimate quite moments quite well making it impossible for the audience to lose interest for the entirety of the experience. With the start of the second set, Yves Charuest added his own personality into the musical pallet providing for a more communicative melodic texture. The use of both a solo and duet set-up made the night even more impressive as Wellman proved not only his ability to entertain a room alone, but he also left enough room in his musical space for another voice. This part of the show began quietly as most conversations do. The spacey nature of the beginning resembles an introduction to a stranger. There are hellos and an even spread of listening and talking as the two people obtain a sense of comfortability with each other. Eventually the conversation reaches new territories and each person is given more space to express themselves. With their respectful sense of rapport, Yves Charuest and Linsey Wellman were able to work together to achieve many different types of conversation ranging from a quick, idea-bouncing brainstorm to a more complete expression of feeling from both sides. Music can come in many different forms but the basic ideas are always the same. An artist needs multiple, contrasting ideas and each of these ideas must be developed as much as possible. With the sheer power of his individuality, Linsey Wellman fully accomplished both of these tasks despite the absence of any pre-writing and he also managed to hold an advanced musical conversation with Yves Charuest. The result was a truly fantastic night at la Plante. This entry was posted in Reviews and tagged Jazz, Lindsey Wellman, Montreal, Saxophone, the plant on February 2, 2016 by librarian.